Fur is where form and function blend in the most beautiful way possible. 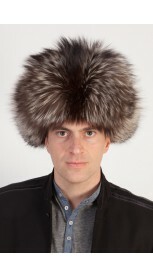 Fur’s may be women’s best friends but they can also be a man’s most stylish accessory. 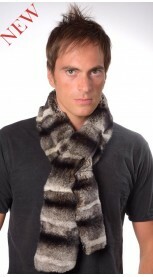 Amifur men’s scarves are made of sable, fox, beaver, karakul, raccoon, rex, brown mink and possum fur. The looks are simply priceless and with a scarf thrown carelessly across your shoulders you can look devilishly handsome. For men of today the function of keeping you snugly warm and comfortable may be of secondary importance but here too nothing comes close to fur. Amifur men’s scarves have that million dollar look because they are made of the finest and freshest fur but they are priced down to earth. This is possible because the scarves are cleverly stitched together seamlessly using remnants. No one is going to inspect the scarf closely and from a distance, it looks as if it is made from a single piece of fur. Go for Amifur men’s scarves and you save a lot in the bargain while you get top quality scarves that last a lifetime and look absolutely spectacular. 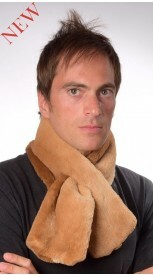 Sable fur scarf is among the world’s most luxurious scarves. This sable fur scarf will never age. It fits both men and women, wishing to be fashionable even in cold winter days. Authentic brown color. Inner polyester lining. Each of our fur accessories is handmade in Italy. We ensure best quality materials. Length 100/105 cm. Width 10/11 cm. -Quality natural fur -Natural color -Inner polyester lining -Warm, soft, real fur accessory -Unisex -Handmade fur product -Made in Italy -Brand Amica snc -Top quality guaranteed NOTE: Order 2 or more items from our International Online Store, and you will receive a special present! 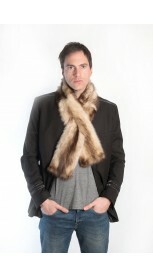 www.amifur.com/receive-present ..
Sable fur scarf is among the world’s most luxurious scarves. This soft sable fur scarf will never age. 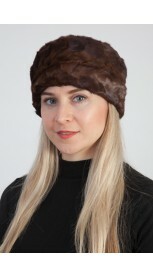 It fits both men and women, wishing to be stylish even in cold winter days. Authentic dark brown natural color. Inner polyester lining. Each of our fur accessories is handmade in Italy. We ensure best quality materials. Length 100/105 cm. Width 10/11 cm. -Quality natural fur -Natural color -Unisex fur scarf -Inner polyester lining -Warm, soft, real fur accessory -Handmade fur product -Made in Italy -Brand Amica snc -Top quality guaranteed NOTE: Order 2 or more items from our International Online Store, and you will receive a special present! 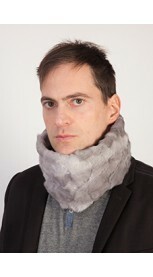 www.amifur.com/receive-present ..
Rex-Chinchilla fur scarf. 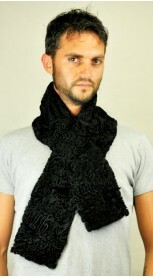 This scarf fits men wishing to be trendy even in cold winter. This fur scarf is extremely soft, warm and stylish. Its absolutely natural color has white-silver to black shades. Inner polyester lining. Each of our fur accessories is handmade in Italy. We ensure best quality materials. Length 110/115 cm. Width 12/13 cm. -Quality natural fur -Unisex fur scarf -Natural color -Inner polyester lining -Warm, soft, real fur accessory -Handmade fur product -Made in Italy -Brand Amica snc -Top quality guaranteed NOTE: Order 2 or more items from our International Online Store, and you will receive a special present! 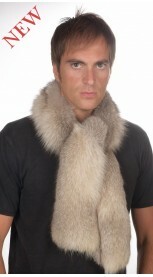 www.amifur.com/receive-present ..
Real silver fox fur scarf. 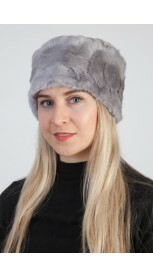 Silver fox fur scarf will never age, it is elegant, fluffy and warm. 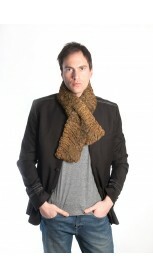 This scarf fits men wishing to be trendy even in coldest winter. Fur on both sides. Authentic natural color. Each of our fur accessories is handmade in Italy. We ensure best quality materials. Length 100/110 cm. -Quality natural fur -Natural color -Unisex -Fur on both sides -Warm, soft, real fur accessory -Handmade fur product -Made in Italy -Brand Amica snc -Top quality guaranteed NOTE: Order 2 or more items from our International Online Store, and you will receive a special present! 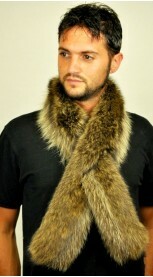 www.amifur.com/receive-present ..
Real blue fox fur scarf. 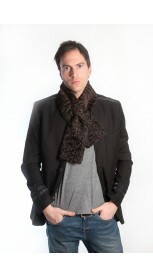 This warm and soft scarf fits men wishing to be trendy even in cold winter. Inner polyester lining. Not natural blue color. Each of our fur accessories is handmade in Italy. We ensure best quality materials.The color visible in the picture might differ from the real product at the sun light, as they are natural products. Length 145/150 cm. -Quality natural fur -Not natural color -Unisex fur scarf -Inner polyester lining -Warm, soft, real fur accessory -Handmade fur product -Made in Italy -Brand Amica snc -Top quality guaranteed NOTE: Order 2 or more items from our International Online Store, and you will receive a special present! 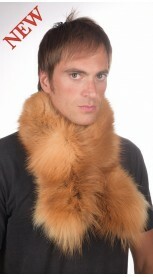 www.amifur.com/receive-present ..
Real Golden fox fur scarf. This authentic and warm scarf fits men wishing to be trendy even in cold winter. Inner polyester lining. Authentic natural golden color. Each of our fur accessories is handmade in Italy. We ensure best quality materials.The color visible in the picture might differ from the real product at the sun light, as they are natural products. Length 120/130 cm. -Quality natural fur -Natural gold color -Unisex fur scarf -Inner polyester lining -Warm, soft, real fur accessory -Handmade fur product -Made in Italy -Brand Amica snc -Top quality guaranteed NOTE: Order 2 or more items from our International Online Store, and you will receive a special present! www.amifur.com/receive-present .. 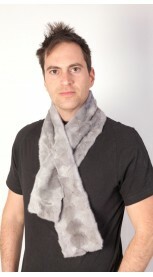 Authentic grey-sapphire fox fur scarf. 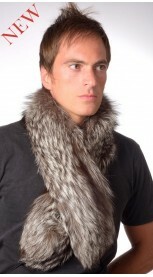 This real fox fur scarf fits men wishing to be trendy even in cold winter. Inner polyester lining. Authentic natural grey-sapphire color. Each of our fur accessories is handmade in Italy. We ensure best quality materials.The color visible in the picture might differ from the real product at the sun light, as they are natural products. Length 130/140 cm. -Quality natural fur -Natural color -Unisex fox fur scarf -Inner polyester lining -Warm, soft, real fur accessory -Handmade fur product -Made in Italy -Brand Amica snc -Top quality guaranteed NOTE: Order 2 or more items from our International Online Store, and you will receive a special present! www.amifur.com/receive-present .. Authentic Silver fox fur scarf. Silver fox fur scarf will never age, it fits men wishing to be trendy even in cold winter. Inner polyester lining. Authentic natural silver color. Each of our fur accessories is handmade in Italy. We ensure best quality materials.The color visible in the picture might differ from the real product at the sun light, as they are natural products. Length 130/140 cm. -Quality natural fur -Natural color -Unisex fox fur scarf -Inner polyester lining -Warm, soft, real fur accessory -Handmade fur product -Made in Italy -Brand Amica snc -Top quality guaranteed NOTE: Order 2 or more items from our International Online Store, and you will receive a special present! 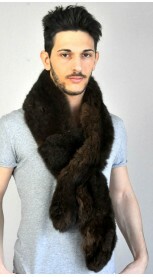 www.amifur.com/receive-present ..
Mink fur scarf never ages. This real fur scarf is stylish, soft and warm. 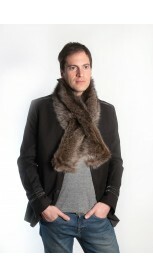 Mink fur scarf is perfect to be trendy men even in cold winter. Its color is absolutely natural. Inner polyester lining. Each of our fur accessories is handmade in Italy. We ensure best quality materials. Length 125/130 cm. Width 10/11 cm. -Quality natural fur -Natural color -Inner polyester lining -Warm, soft, real fur accessory -Handmade fur product -Made in Italy -Brand Amica snc -Top quality guaranteed NOTE: Order 2 or more items from our International Online Store, and you will receive a special present! www.amifur.com/receive-present .. This brown (authentic Canadian) beaver fur scarf has been designed for trendy men, caring their appearance even in cold winter. This scarf is warm, soft and trendy. Its brown color is absolutely natural. Inner polyester lining. Each of our fur accessories is handmade in Italy. We ensure best quality materials. Length 105/110 cm. Width 14/16 cm. -Quality natural fur -Natural color -Inner polyester lining -Warm, soft, real fur accessory -Handmade fur product -Made in Italy -Brand Amica snc -Top quality guaranteed NOTE: Order 2 or more items from our International Online Store, and you will receive a special present! www.amifur.com/receive-present .. 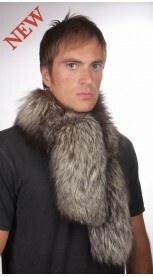 This Authentic Canadian beaver fur scarf has been designed for trendy men, caring their appearance even in cold winter. This scarf is warm, soft and trendy. Its champagne color is absolutely natural. Fur on both sides. Each of our fur accessories is handmade in Italy. We ensure best quality materials. Length 90 cm. Width 12/13 cm. -Quality natural fur -Natural color -Warm, soft, real fur accessory -Handmade fur product -Made in Italy -Brand Amica snc -Top quality guaranteed NOTE: Order 2 or more items from our International Online Store, and you will receive a special present! www.amifur.com/receive-present .. 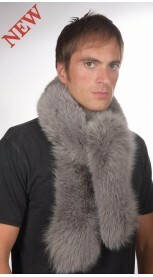 Authentic Petit-gris fur scarf. 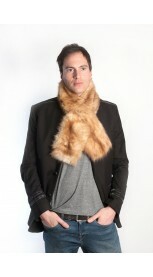 This fur scarf fits men wishing to be trendy even in cold winter. This fur scarf is absolutely warm and very high quality. Its absolutely natural color has brown to black shades. Inner polyester lining. Each of our fur accessories is handmade in Italy. We ensure best quality materials. The color visible in the picture might differ from the real product at the sun light, as they are natural products. Length 115/120 cm. Width 17/18 cm. -Quality natural fur -Unisex fur scarf -Natural color -Inner polyester lining -Warm, soft, real fur accessory -Handmade fur product -Made in Italy -Brand Amica snc -Top quality guaranteed NOTE: Order 2 or more items from our International Online Store, and you will receive a special present! www.amifur.com/receive-pres.. 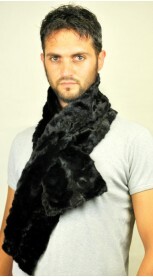 This authentic polecat fur scarf has been designed for trendy men, caring their appearance even in cold winter. This scarf is warm, soft and trendy. Its absolutely natural color has cream-brown to black shades. Inner polyester lining. Each of our fur accessories is handmade in Italy. We ensure best quality materials. Length 125/130 cm. Width 10/11 cm. -Quality natural fur -Unisex fur scarf -Natural color -Inner polyester lining -Warm, soft, real fur accessory -Handmade fur product -Made in Italy -Brand Amica snc -Top quality guaranteed NOTE: Order 2 or more items from our International Online Store, and you will receive a special present! 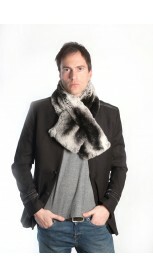 www.amifur.com/receive-present ..
Sable fur scarf is among the world’s most luxurious scarves. This warm and soft sable fur scarf will never age. 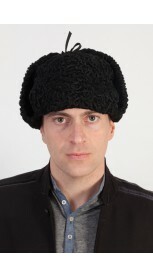 It fits both men and women, ideal for cold winter days. Authentic natural brown color. Inner polyester lining. Each of our fur accessories is handmade in Italy. We ensure best quality materials. Length 125/130 cm. Width 12/14 cm. -Quality natural fur -Natural color -Unisex fur scarf -Inner polyester lining -Warm, soft, real fur accessory -Handmade fur product -Made in Italy -Brand Amica snc -Top quality guaranteed NOTE: Order 2 or more items from our International Online Store, and you will receive a special present! www.amifur.com/receive-present .. 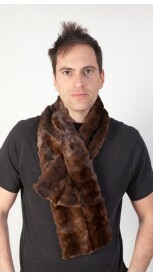 This Canadian beaver fur scarf has been designed for trendy men, caring their appearance even in cold winter. This scarf is very warm and soft. Its champagne color is absolutely natural. Inner polyester lining. Each of our fur accessories is handmade in Italy. We ensure best quality materials. Length 110/115 cm. Width 12/13 cm. -Quality natural fur -Natural color -Inner polyester lining -Warm, soft, real fur accessory -Handmade fur product -Made in Italy -Brand Amica snc -Top quality guaranteed NOTE: Order 2 or more items from our International Online Store, and you will receive a special present! 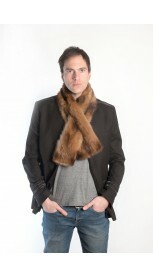 www.amifur.com/receive-present ..
Mink fur scarf never ages. This Scandinavian mink fur scarf is stylish, soft and warm. This scarf is perfect to be trendy men even in cold winter. Its color is absolutely natural. Inner polyester lining. Each of our fur accessories is handmade in Italy. We ensure best quality materials. Length 115/120 cm. Width 9/10 cm. -Quality natural fur -Unisex fur scarf -Natural color -Inner polyester lining -Warm, soft, real fur accessory -Handmade fur product -Made in Italy -Brand Amica snc -Top quality guaranteed NOTE: Order 2 or more items from our International Online Store, and you will receive a special present! 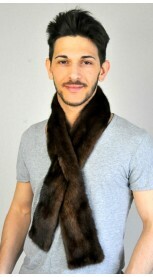 www.amifur.com/receive-present ..
Our dark polecat fur scarf has been designed for trendy men, caring their appearance even in cold winter. This scarf is warm, soft and stylish. Its absolutely natural dark brown color. Inner polyester lining. Each of our fur accessories is handmade in Italy. We ensure best quality materials. Length 125/130 cm. Width 12/13 cm. -Quality natural fur -Unisex fur scarf -Natural color -Inner polyester lining -Warm, soft, real fur accessory -Handmade fur product -Made in Italy -Brand Amica snc -Top quality guaranteed NOTE: Order 2 or more items from our International Online Store, and you will receive a special present! www.amifur.com/receive-present .. 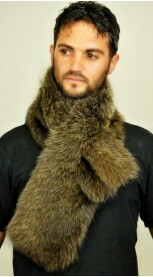 This real possum fur scarf has been designed for trendy men, caring their appearance even in cold winter. This scarf is very warm, soft and trendy. Its dark brown color is absolutely natural. Inner polyester lining. Each of our fur accessories is handmade in Italy. We ensure best quality materials. Length 125/130 cm. Width 12/14 cm. -Quality natural fur -Unisex fur scarf -Natural color -Inner polyester lining -Warm, soft, real fur accessory -Handmade fur product -Made in Italy -Brand Amica snc -Top quality guaranteed NOTE: Order 2 or more items from our International Online Store, and you will receive a special present! www.amifur.com/receive-present .. Authentic, warm and soft fur scarf. Raccoon fur scarf will never age. It fits both men and women. Authentic natural color. Inner polyester lining. Each of our fur accessories is handmade in Italy. We ensure best quality materials. Length 105/110 cm. Width 14/15 cm. -Quality natural fur -Unisex fur scarf -Natural color -Inner polyester lining -Warm, soft, real fur accessory -Handmade fur product -Made in Italy -Brand Amica snc -Top quality guaranteed NOTE: Order 2 or more items from our International Online Store, and you will receive a special present! 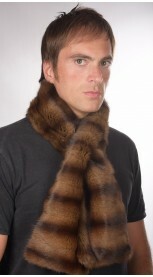 www.amifur.com/receive-present ..
Raccoon fur scarf will never age. Extremely warm and soft fur scarf. It fits both men and women. 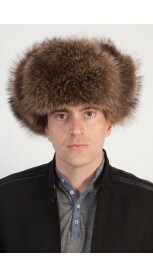 Fur on both sides. Authentic natural color. Each of our fur accessories is handmade in Italy. We ensure best quality materials. Length 110/115 cm. Width 11/12 cm. -Quality natural fur -Natural color -Unisex fur scarf -Fur on both sides -Warm, soft, real fur accessory -Handmade fur product -Made in Italy -Brand Amica snc -Top quality guaranteed NOTE: Order 2 or more items from our International Online Store, and you will receive a special present! www.amifur.com/receive-present .. Elegant black karakul fur scarf. This scarf fits both men and women. 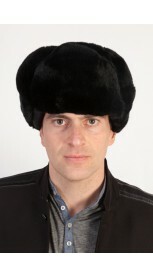 This real fur scarf is trendy, warm and has a brilliant black color. Inner lining with black polyester. Each of our fur accessories is handmade in Italy. We ensure best quality materials. Length 115/120 cm. Width 10/11 cm. -Quality natural fur -Natural color -Unisex fur scarf -Inner polyester lining -Warm, soft, real fur accessory -Handmade fur product -Made in Italy -Brand Amica snc -Top quality guaranteed NOTE: Order 2 or more items from our International Online Store, and you will receive a special present! 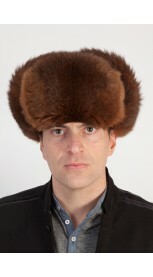 www.amifur.com/receive-present ..
Brown karakul fur scarf. This scarf fits both men and women. 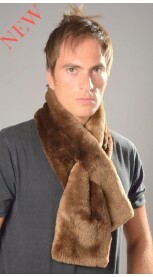 This real fur scarf is trendy and has a brilliant brown color. Inner polyester lining . Each of our fur accessories is handmade in Italy. We ensure best quality materials. Length 115/120 cm. Width 9/10 cm. -Quality natural fur -Natural color -Unisex fur scarf -Inner polyester lining -Warm, soft, real fur accessory -Handmade fur product -Made in Italy -Brand Amica snc -Top quality guaranteed NOTE: Order 2 or more items from our International Online Store, and you will receive a special present! 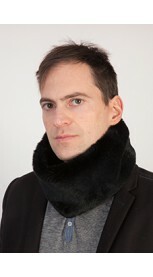 www.amifur.com/receive-present ..
Black mink fur scarf, created with black mink fur remnants. This scarf fits both men and women. This scarf is trendy and has a brilliant black color. Inner lining with black polyester. Each of our fur accessories is handmade in Italy. We ensure best quality materials. Length 115/120 cm. Width 10 cm. -Quality natural fur -Not natural black color -Unisex fur scarf -Inner polyester lining -Warm, soft, real fur accessory -Handmade fur product -Made in Italy -Brand Amica snc -Top quality guaranteed NOTE: Order 2 or more items from our International Online Store, and you will receive a special present! 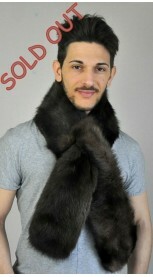 www.amifur.com/receive-present ..
Real black mink fur scarf, created with black mink fur remnants. This scarf fits both men and women. This scarf is trendy and has a brilliant black color. Inner lining with black polyester. Each of our fur accessories is handmade in Italy. We ensure best quality materials. Length 115/120 cm. Width 18/20 cm. -Quality natural fur -Not natural black color -Unisex fur scarf -Inner polyester lining -Warm, soft, real fur accessory -Handmade fur product -Made in Italy -Brand Amica snc -Top quality guaranteed NOTE: Order 2 or more items from our International Online Store, and you will receive a special present! 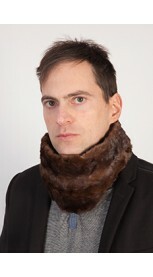 www.amifur.com/receive-present ..
Brown mink fur scarf, created with brown mink fur remnants. This scarf fits both men and women. 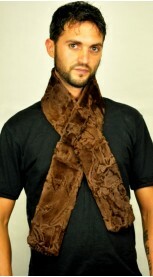 This scarf is trendy and has a brilliant brown color. Inner lining with brown polyester. Each of our fur accessories is handmade in Italy. We ensure best quality materials. Length 115/120cm. Width 16/18 cm. -Quality natural fur -Natural color -Inner polyester lining -Warm, soft, real fur accessory -Handmade fur product -Made in Italy -Brand Amica snc -Top quality guaranteed NOTE: Order 2 or more items from our International Online Store, and you will receive a special present! www.amifur.com/receive-present .. 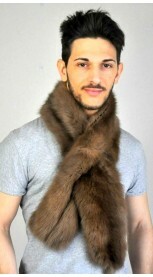 This Sapphire mink fur scarf has been designed for trendy men, caring their appearance even in cold winter. This mink fur scarf is elegant, warm and stylish. 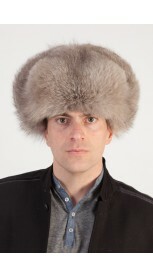 Each of our men's fur accessories is handmade in Italy. We ensure best quality materials. Length 115/120 cm. Width 12/13 cm. -Quality natural mink fur -Not natural color -Inner satin lining -Warm, soft, real fur accessory -Handmade fur product -Made in Italy -Brand Amica snc -Top quality guaranteed NOTE: Order 2 or more items from our International Online Store, and you will receive a special present! www.amifur.com/receive-present ..
-Length 105/110 cm -Width 12/13 cm -Quality natural raccoon fur -Natural silver brown color -Unisex. 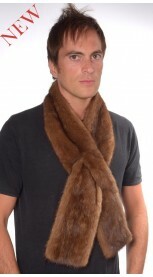 For Men & Women -One size fits all -A slit opening to hold scarf in place -Satin lined interior -Warm, soft, real fur accessory -Handmade -Made in Italy -Brand Amica snc -We ensure best quality materials ..
-Length 100/105 cm -Width 13/15 cm -Quality natural Canadian sable fur -Natural gold color -Unisex. For Men & Women -One size fits all -A slit opening to hold scarf in place -Satin lined interior -Warm, soft, real fur accessory -Handmade -Made in Italy -Brand Amica snc -We ensure best quality materials ..
-Length 115/120 cm -Width 13/15 cm -Quality natural polecat fur -Natural color -Unisex fur scarf. For Men & Women -One size fits all -A slit opening to hold scarf in place -Satin lined interior -Warm, soft, real fur accessory -Handmade -Made in Italy -Brand Amica snc -We ensure best quality ..
-Length 115/120 cm -Width 13/15 cm -Quality natural polecat fur -Natural cream color -Unisex fur scarf. For Men & Women -One size fits all -A slit opening to hold scarf in place -Satin lined interior -Warm, soft, real fur accessory -Handmade -Made in Italy -Brand Amica snc -We ensure best quality ..
-Length 150/155 cm -Width 11/12 cm -Quality natural beaver fur -Natural color champagne-gold -Unisex fur scarf. For Men & Women -One size fits all -A slit opening to hold scarf in place -Satin lined interior -Warm, soft, durable fur accessory -Handmade -Made in Italy -Brand Amica snc -We ensure best quality materials ..
-Length 110/115 cm -Width 16/18 cm -Quality natural black rex fur -Unisex fur scarf. For Men & Women -One size fits all -A slit opening to hold scarf in place -Satin lined interior -Warm, soft, real fur accessory -Handmade -Made in Italy -Brand Amica snc -We ensure best quality materials ..
-Length 100/105 cm -Width 11/12 cm -Quality natural persian karakul fur -Natural brown color -Unisex. For Men & Women -One size fits all -A slit opening to hold scarf in place -Satin lined interior -Warm, soft, real fur accessory -Handmade -Made in Italy -Brand Amica snc -We ensure best quality materials ..
-Length 100/105 cm -Width 11/12 cm -Quality natural persian karakul fur -Unisex. For Men & Women -One size fits all -A slit opening to hold scarf in place -Satin lined interior -Warm, elegant, real fur accessory -Handmade -Made in Italy -Brand Amica snc -We ensure best quality materials ..
-Length 115/120 cm -Width 8/9 cm -Quality natural Scandinavian mink fur -Natural color -Unisex. For Men & Women -One size fits all -A slit opening to hold scarf in place -Satin lined interior -Warm, soft, real fur accessory -Handmade -Made in Italy -Brand Amica snc -We ensure best quality materials ..
-Length 110/115 cm -Width 11/12 cm -Quality natural rex fur -Unisex. For Men & Women -One size fits all -A slit opening to hold scarf in place -Satin lined interior -Warm, soft, real fur accessory -Handmade -Made in Italy -Brand Amica snc -We ensure best quality materials ..
-Length 110/115 cm -Width 16/17 cm -Quality natural rex fur -Unisex. For Men & Women -One size fits all -A slit opening to hold scarf in place -Satin lined interior -Warm, soft, real fur accessory -Handmade -Made in Italy -Brand Amica snc -We ensure best quality materials ..
-Length 210-220 cm -Width 18-20 cm -Quality natural rex fur -Not natural black color -Inner satin lining -Warm, soft, real fur stole-scarf -Handmade -Made in Italy -Brand Amica snc -Top quality guaranteed ..
-Length 210-220 cm -Width 18-20 cm -Quality natural rex-chinchilla fur -Not natural color -Inner satin lining -Warm, soft, real fur stole-scarf -Handmade -Made in Italy -Brand Amica snc -Top quality guaranteed ..
-Length 210-220 cm -Width 18-20 cm -Quality natural mink fur -Created with black mink fur remnants -Not natural black color -Inner satin lining -Warm, stylish, real fur stole-scarf -Handmade -Made in Italy -Brand Amica snc -Top quality guaranteed ..
-Length 180-200 cm -Width 14-15 cm -Quality natural raccoon fur -Natural color -Inner satin lining -Warm, soft, real fur stole-scarf -Handmade -Made in Italy -Brand Amica snc -Top quality guaranteed ..
-Length 65-70 cm -Width 18-20 cm -Quality natural mink fur -Not natural black color -Created with black mink fur remnants -Inner satin lining -Warm, elegant, soft, real fur neck warmer -Handmade -Made in Italy -Brand Amica snc -Top quality guaranteed ..
-Length 62-63 cm -Width 15-16 cm -Quality natural mink fur -Created with brown mink fur remnants -Natural brown colour -Unisex. 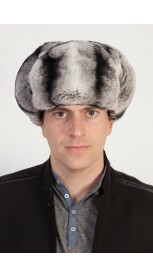 For Men and Women -One size fits all -Satin lined interior -Warm, elegant, real fur accessory -Handmade -Made in Italy -Brand Amica snc -We ensure best quality materials ..
-Length 62-65 cm -Width 18-19 cm -Quality natural mink fur -Created with mink fur remnants -Not natural grey-sapphire colour -Unisex. For Men and Women -One size fits all -Satin lined interior -Warm, elegant, real fur accessory -Handmade -Made in Italy -Brand Amica snc -We ensure best quality materials ..
-Quality natural rex-chinchilla fur -Not natural color -Inner satin lining -Warm, extremely soft, real fur collar -Handmade -Made in Italy -Brand Amica snc -Top quality guaranteed ..
-Quality natural rex fur -Not natural black color -Inner satin lining -Warm, extremely soft, real fur collar -Handmade -Made in Italy -Brand Amica snc -Top quality guaranteed ..
-Quality natural mink fur -Not natural black color -Created with black mink fur remnants -Inner satin lining -Warm, elegant, soft, real fur collar -Handmade -Made in Italy -Brand Amica snc -Top quality guaranteed ..
-Quality natural raccoon fur -Natural color -Inner satin lining -Warm, stylish, soft, real fur collar -Handmade -Made in Italy -Brand Amica snc -Top quality guaranteed ..